The Norwegian sailor Albert Moss survived the Titanic tragedy as well as WW1 and WW2. Home Titanic Survivors Albert Johan Moss The Norwegian sailor Albert Moss survived the Titanic tragedy as well as WW1 and WW2. The Norwegian sailor Albert Moss survived both the Titanic disaster and a number of other crucial experiences at sea. 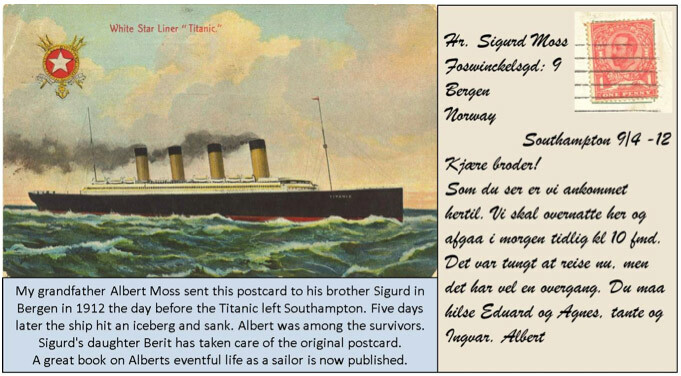 The story of his life is now documented in the book Titanic og to verdenskriger (Titanic, WW1, and WW2). In the autumn 1911, Albert Moss was first officer on board the Norwegian cargo ship S/S Hebe on its way from a Swedish port in the Baltic to Preston on the west coast of England. Outside Preston Albert and the rest of the crew at S/S Hebe fell victim to a dramatic shipwreck on the 11th of December. The ship was crushed against the cliffs, but fortunately the entire crew was rescued by a lifeboat from nearby Southport. Albert returned to Bergen just in time to celebrate Christmas with his siblings. Both of his parents had recently passed away. In the spring of 1912, Albert signed on as first officer on the Norwegian cargo ship S/S Norheim. Albert and two other Norwegian sailors were to meet the ship in Philadelphia in April. The British coal strike meant no coal ships were leaving for America at that time, and the only option for Albert was to travel on the Titanic. Albert and his two companions arrived in Southampton the day before departure. On board the Titanic, Albert and the two seamen shared a third class cabin at the E-deck. The ship left Southampton on schedule, and visited Cherbourg and Queenstown before the course was set for New York. On Sunday evening, the 14th of April, Albert and his companions were lying in their bunks when they suddenly felt a bump as if the ship was docking. Having sailed in these waters for years, Albert immediately understood what had happened. The trio left their cabin to assess the situation and could observe pieces of ice on the forward well deck. A couple of hours later, Albert was swept overboard along with collapsible B, and several men around. After some time he reached the same boat lying upside-down in the water, and managed to climb on to it, as did 20-30 other men. A continuous and terrible scream filled the air when the Titanic finally went down and the remaining passengers and crew on board fell into the water. These screams haunted Albert the rest of his life. A few hours later the men on collapsible B were picked up by some returning lifeboats; the one Albert got aboard was the last to reach the Carpathia, eight hours after the collision with the iceberg, and more than six hours after Albert and the others had been washed overboard. The Carpathia arrived in New York on the 18th of April, 1912 and Albert spent the next two weeks convalescing at St. Vincent's hospital before continuing to Philadelphia to work on the S/S Norheim as planned. He carried on as a sailor, apparently unaffected by what he had gone through. After several years on the S/S Norheim Albert was appointed captain on another Norwegian steamer, the S/S Nordkyn. Although Norway was not involved in World War I, the S/S Nordkyn was torpedoed and sunk west of Morocco. Albert and all the crew members survived the ordeal. Back home in Bergen, Albert married his niece Ingrid, the daughter of his elder brother Bernhard. He then took a ten year hiatus from his seafaring life and became a partner in his brother Sigurd's book bindery. Ingrid and Albert had three children, Gunvor, Egil, and Reidun, born between 1919 and 1923. In 1931 Albert returned to the sea and became first officer on board a coal ship sailing from Spitzbergen to Europe during the summer season. Norway was unwillingly brought into World War II and occupied by Germany in the beginning of April of 1940. The coal transport continued during that summer and the next. In August 1941, the coal steamers were met at Spitzbergen by Allied warships and transferred via Iceland to Scotland. During this exchange Albert was appointed captain of the S/S Munin, which sailed to British waters. From the beginning of June 1944, Albert and the S/S Munin were engaged in the transport of ammunition and other dangerous goods to Normandy as part of Operation Neptune. Neither the ship nor crew were physically hurt during World War II, but the ongoing fear of torpedoes, mines, and bombs undoubtedly was extremely stressful and likely to have caused severe psychological problems for many war sailors. After WW2, Albert came home in January 1946 and lived a quiet life for 27 years as a pensioner together with Ingrid, their children and grandchildren. The summer seasons were spent at small farms or cottages at the coast where Albert enjoyed trolling on long rowboat trips during bright summer nights. When the catch exceeded the family's need, as it often did, the rest was given away to friends and neighbors. However, Albert's health gradually declined and at 90 years of age, he passed away at his home in Persenbakken in Bergen on the 4th of July, 1973. Already as convalescent in New York, Albert was interviewed by the newspaper Nordisk Tiden de. 40 years later he was interviewed by Morgenavisen in Bergen. But Albert mostly declined to speak about his many tormenting experiences, including the Titanic disaster. In Albert's opinion, more than enough had already been told and written about the Titanic catastrophe. However, in 1962 several Norwegian news papers mistakenly reported that the last surviving Norwegian from the Titanic, Bernt Johannessen, had recently passed away. Albert was challenged by this, and agreed to be interviewed as many as three times that year, including once by the Norwegian Broadcasting Corporation. Albert’s daughter, Reidun, and her husband, Håkon, had five children who grew up when Albert was a pensioner. 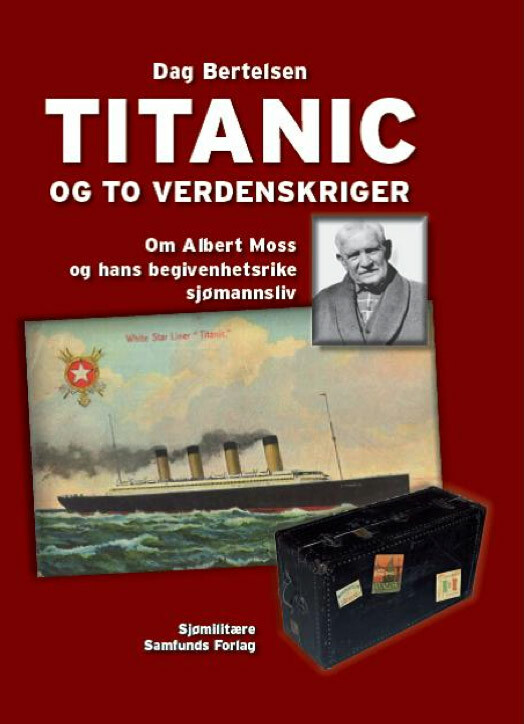 The book Titanic og to verdenskriger has resulted from the interests and efforts of the eldest grandson Dag. In addition to the story of Albert's life, short biographic data is included on 27 men who most likely shared the limited space on collapsible B with Albert, many of them were crew members on board the Titanic. Owing to the postcard and photo collection left behind by Albert's brother Eduard, the book is richly illustrated, and should be of great interest to many readers. An English summary is also included in the book.